HomeGeneral NewsWhat? There were Jews in Somalia? It was in 2007 that Nancy Hartevelt Kobrin came across an article in the Jerusalem Post revealing the existence of Avraham the Blogger, the last Jew of Somalia. (Our PoNR post carrying an extract attracted 38 comments, mostly from Somalis – some sympathetic, some antisemitic.) Her curiosity piqued that a Jew could survive in a country hostile to Jews, Dr Kobrin exchanged emails with Avraham (Rami) over three years: they would serve as the basis for a book she has just published. Then, in 2010, the trail went cold. I asked to be put in touch with Av, who also called himself Rami. We corresponded from 2007 to 2010 – over 300 emails. I came to know this wonderful young Jewish man and his inspiring mother, Ashira Haybi. They were alone without family, with roots extending back well over one hundred years. Rami’s dad, killed during the civil war, traced his roots to Aden, Yemen, while his mom traced hers to Ta’iz, also in Yemen. Ashira was an accomplished businesswoman trading in textiles. She kept a kosher home, was Shabbat observant and raised Rami to continue the tradition. They fought vigorously to preserve their Judaism under extreme duress. Jews sailed across the Gulf of Arabia from Yemen to found a community in Somalia. It is thought that the Ybir tribe converted from Judaism in the 13th century. Rami spoke candidly about the fierce antisemitism and hatred of the yahud, the Jew. Oddly, it was a Somali Muslim physicist living in London in the Anglo-Somali diaspora who pondered the Jewish diaspora experience and wondered why his people were struggling to adapt. How had the Jews done it? In many ways, Rami and Ashira’s plight calls to mind how the Jews in Nazi-occupied countries were hunted down and exterminated as signs of the Holocaust became manifest. Ordinary people had to ask themselves: when does one leave the land in which you were born and raised and where your grandparents and great-grandparents have lived for generations? And if you must leave, how can you make the arrangements, find the courage and plunge into the unknown? The emails are a gateway into the terrifying world in which Rami and his mother lived and persevered against seemingly impossible odds. It is often difficult for the lay public to understand the toll that chronic stress and trauma take upon an individual’s psyche. To live in such a toxic environment, under the constant threat of death just because you are a Jew, may seem irrelevant to non-Jews and especially those who profess Islamic antisemitism. It has been said by some Somalis that they do not know Jews. Perhaps one of the biggest opportunities to counter antisemitism among the Muslim communities is the potential for Somali Muslim diaspora communities to begin to know Jews. This could dissolve their irrational learned hatred of the Jew. The emails broke off suddenly in 2008 and then again suddenly I received one email several days after Passover in 2010. Rami promised that he would write more and said it was a sign from “Hashem” that he had remembered his complicated question and password. Tragically I never heard from him again. Over the years I have continued my search for Rami and his mother. Seven years have passed. My thoughts often turn to all the millions of families who were caught up in the Holocaust, the dead, the survivors, their relatives and friends who even now continue to search for each other. A year and a half ago it dawned on me that there was virtually nothing written about Somali Jewry. I realized that Rami’s emails were essentially the only extant documents of the last remnant of contemporary Jews in Somalia. As I began to draft the book, my colleague Dr. Norman Simms read the correspondence and referred to Rami and his mother as “crypto-Jews.” Simms is an expert on Sephardi culture. What struck me was that it was so obvious and yet I had never thought of that phrase. Was it because I was so terrified to think of the consequences of living a Jewish life in Somalia? 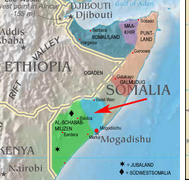 I contacted Mohammed Diriye Abdullahi, author of Culture and Customs of Somalia. He verified that he had heard about a crypto- Jewish community in Mogadishu. Rami’s emails bear witness to Jewish survival in a hostile Somali environment under constant threat of attack by Al Shabaab and the clan warlords. Acknowledgment of the existence of the Jews should be part of the effort to enhance Somalia’s pluralism. A future healthy and less violent Somalia may very well depend upon the country’s ability to recuperate and embrace its diversity, especially that of its persecuted minorities.